Why “smoothies at the poolside” could be biggest killer of the modern age. “Green smoothies and green juicing have taken the world by storm. Everywhere you look, there are green smoothie detoxes, and green juice powders, and green drink “cleanses”. These green smoothies or green juices often contain a large amount of spinach, kale, chard, collards, arugula, or other greens. Yes, we have heard our whole lives that we should be eating more greens, but the green juice/smoothie cleanse may have taken it a step too far. While a little may be good, too much is NOT GOOD. As you have probably heard me say over and over again, “Eat REAL food”. I have never been a huge fan of smoothies, shakes and juices. Real food is where it’s at. I certainly don’t think our primal ancestors lugged a blender or juicer around during the day to blend up all those berries and greens they gathered. Nope, chewing is important, and it is necessary part of good digestion and good health. Smoothies sound great, but since they are liquefied food, you generally end up consuming WAY more than you normally would if you were eating those things as solid food. What would fill a massive bowl as whole food, gets blended down into the size of a large drinking glass. There is often too much fruit, too much sugar, too many greens, too many carbohydrates, etc. All downed with a just a couple of gulps. And as we’ll show you in a minute, there can also be TOO much of some problematic compounds in these green smoothies or green juices that you need to know. 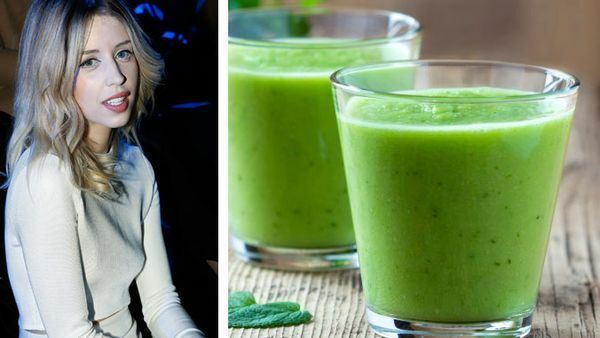 Peaches Geldof, who died from addictive disorder in 2015 , boasted about the cleansing effect of the green stuff, but was it just a part of the addictive disorder that claimed her life?